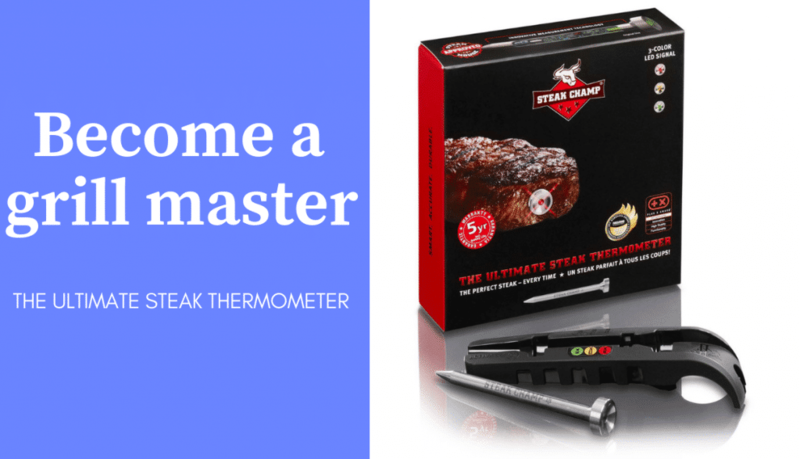 Today we’ve got the SteakeChamp three-color meat thermometer we’re going to be testing out; we’ve got an excellent New York strip steak we’re going to be using for the test. You can cook on three temperatures, medium rare, medium and medium well. The unit is made out of stainless steel, and it’s got a LED light at the end to tell us exactly what temperature we’re at while cooking. 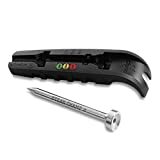 It’s got an internal battery built-in the unit, so there is no replacing it; however, since this light is led, it uses very little energy. 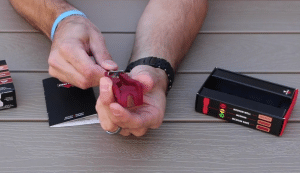 To activate it you put it in the bottom of the activator, and you’ll begin to see the light blinking, which means it’s ready to go. So, we’re going to go ahead and grab the New York Strip and get the thermometer inserted to begin cooking. 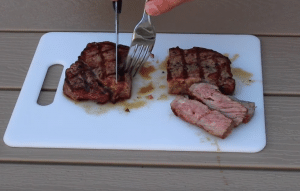 We want to make sure that goes all the way into the center of the steak, and the only part that should be protruding from the steak is the thermometer’s wing. We’re going to go ahead and cook our steak. After a few flips it looks like we’ve got a yellow blinking light, so we’re going to take it off the grill and let rest for a few minutes. In the meantime, we’re going to check out the temperature. We know that for a medium steak we should be approximately 135 – 145 degrees. With the help of a meat thermometer, it looks like we are right at a hundred and thirty-one degrees, so looks like it did an excellent job. We’ll go ahead and let that continue to rest for a few minutes and then pull that thermometer out and cut into it. After a five minute period, the lights will begin to stop blinking, and that is how we know that our rest time is up and we’re ready to pull that thermometer out. 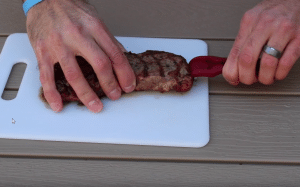 All we’re going to do at this point is take our activator; it’s got an excellent little tool built in so you just grab and pull right out of the steak. And the final results are perfect. Our steak is ready to eat! 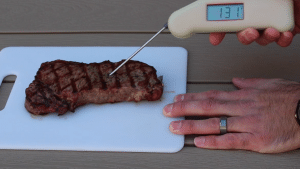 The steakchamp is one of the best wireless meat thermometers, and it gives an instant read so you will never end up with overdone steaks.